A man driving the wrong way on the inner loop of the Capital Beltway was killed when he struck another vehicle in Fairfax County, Virginia, early Monday morning. 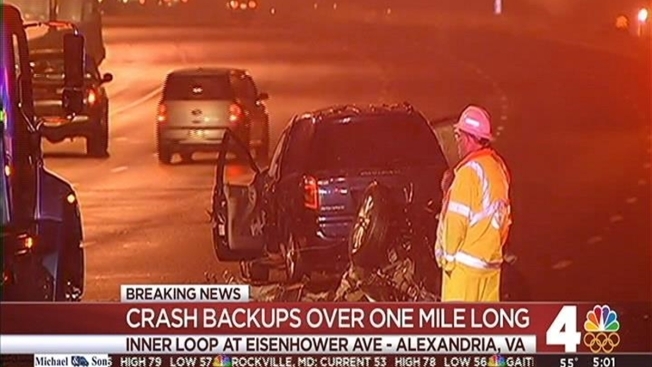 Virginia State police say they got a call at 1:35 a.m. Monday about a wrong-way driver in the westbound lanes of I-495 near Eisenhower Avenue. Within minutes, before officers had arrived, another caller reported that the wrong-way driver had collided with another vehicle. Police believe the man was driving 65 mph when he struck a Chevrolet Tahoe head-on. The axle from the wrong-way driver's Honda CR-V struck a third vehicle, a Dodge Caravan, police said. The wrong-way driver has been identified as Francisco Taveres, 37, of the Bronx, New York, Virginia State Police said. Taveres, the only occupant of the Honda CR-V, died at the scene. Three other people -- the driver and a passenger from the Tahoe and the driver of the Caravan -- were taken to a hospital with non-life-threatening injuries. Police said Tuesday afternoon that the cause of the crash remained under investigation.